Descubra Moab desde una perspectiva distinta gracias a esta excursión diurna en barco jet por el río Colorado de 3 horas. Entre otras cosas, disfrute del paisaje fascinante que forman las paredes de los cañones, de 670 metros de altura (2200 pies), que emergen desde el agua, descubra un lecho marino fosilizado, admire los petroglifos indios y observe lugares en los que se han rodado infinidad de películas y anuncios. Es posible salir por la mañana o por la tarde. Our party of four enjoyed our jet boat tour on the Colorado immensely. Our captain and tour guide was knowledgeable, friendly and had a good sense of humor. Although young, we was very experienced and answered every question thoroughly and easily. The scenery was spectacular and the morning tour was the perfect time to go since the temperature was still comfortable. Each of us thought the tour was interesting, well done and a good value. When you arrive at Moab be sure and take the jet boat ride we had a great Guide and pilot. We used a lot of information he had about the area and really had a great time as we visited different areas. 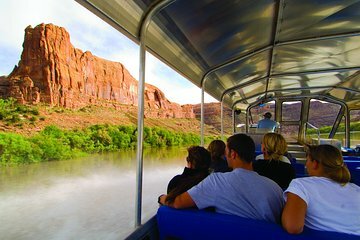 Colorado River Tour is an absolute must while in Moab. Courtney, our captain andvtourvguidecwas amazing. His knowledge and great sense of humor was very refreshing. The views were amazing! Don't miss it! So fun! What a great way to see these amazing canyons from a different perspective. The tour guide, Andrew, was funny !, knowledgeable, accommodating, and did an amazing job navigating the boat through very shallow waters. I highly recommend! Very scenic boat ride. Courtney, the tour guide, was very knowledgable and his humor made the ride even more enjoyable. I highly recommend this tour. We loved this tour! Beautiful views and a hilarious tour guide. You will love this tour! Great scenic tour, Boat is a sightseeing boat, but definitely not too slow and boring. Great guide, very knowledgeable and entertaining. Scenery is incredible, unlike anything else. I will probably go again next year while in Moab. Tour is just the right length. Stunning.